March 14, 2016, Adrian, Michigan – Do you often find yourself stressed out and angry about the situation in our world today – or your own situation? A regular practice of meditation and mindfulness can help us soften our hearts through greater knowledge of our own suffering and darkness. Sister Esther Kennedy, OP, offers a monthly Day of Contemplative Prayer – Mindfulness and Meditation. The next session will be held from 10:00 a.m. to 2:30 p.m. Saturday, March 19 at Weber Retreat and Conference Center. The $35 cost includes lunch. Learn more about the program and register here. March 14, 2016, Adrian, Michigan – The Adrian Dominican Sisters opened their doors to Lenawee County community members, donors, Co-workers and their families, staff members of Siena Heights University, and other interested guests March 9. An Evening with the Adrian Dominican Sisters, a special event for National Catholic Sisters Week, gave Sisters, Associates, Co-workers and guests a unique opportunity to get to know one another. Sister Attracta Kelly, OP, Prioress of the Congregation, welcomes open house guests. In her opening address early in the evening, Sister Attracta Kelly, OP, Prioress of the Congregation, presented a brief history and background of the Adrian Dominican Congregation. She also emphasized the special relationship the Congregation has to their local neighbors. 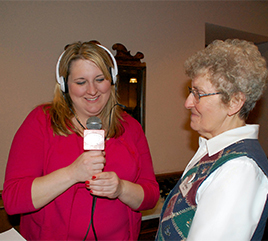 Sara Bingham, left, of WLEN Radio, interviews Sister Carleen Maly, OP, Director of the Adrian Rea Literacy Center. Before the two-hour event began, Sara Bingham, of WLEN Radio, offered a remote broadcast from the Adrian Room of Madden Hall, where the refreshments and information tables were set up. 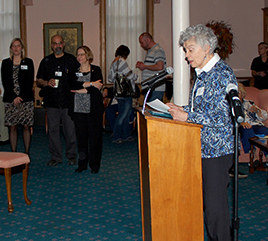 She invited community members to attend the open house and conducted brief interviews with a number of representatives of Adrian Dominican programs: Sister Lorraine Réaume, OP, Formation Director; Sister Maria Goretti Browne, OP, on the Sisters; Associate Arlene Bachanov on the Congregation’s history; Erin Dress, Human Resources Director, on employment opportunities; Sister Peg O’Flynn, OP, on Weber Center; Sister Carleen Maly, OP, on the Adrian Rea Literacy Center; Jennifer Hunter and Ashley LaVigne on the campus; Sister Carol Coston, OP, on permaculture; and Amy Palmer on development. 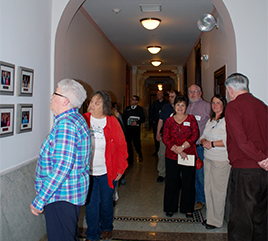 Guests stroll through the first-floor corridor of Madden Hall during a guided tour of the Motherhouse. Throughout the evening, guests were invited to meet the Sisters and learn about their lives, browse the various information tables, take part in a guided tour of the Motherhouse, and enjoy refreshments and companionship with others. An Evening with the Adrian Dominican Sisters was funded by a grant from National Catholic Sisters Week to enable local community members to come to know the Congregation and the presence of the Adrian Dominican Sisters and Associates among them. Held March 8-14 every year, the week gives people throughout the United States the opportunity to become more aware of Catholic Sisters and the role they play in Church and in society. Read a related article by Lonnie Huhman in the Daily Telegram.